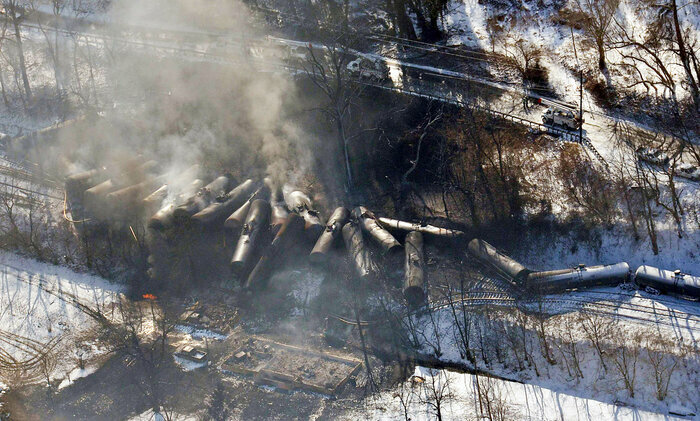 The federal government’s new rules aimed at preventing explosive oil train derailments are sparking a backlash from all sides. The railroads, oil producers and shippers say some of the new safety requirements are unproven and too costly, yet some safety advocates and environmental groups say the regulations aren’t strict enough and still leave too many people at risk. Since February, five trains carrying North Dakota Bakken crude oil have derailed and exploded into flames in the U.S. and Canada. No one was hurt in the incidents in Mount Carbon, W.Va., and Northern Ontario in February; in Galena, Ill., and Northern Ontario in March, and in Heimdal, N.D., in May. But each of those fiery train wrecks occurred in lightly populated areas. Scores of oil trains also travel through dense cities, particularly Chicago, the nation’s railroad hub. According to state records and published reports, about 40 or more trains carrying Bakken crude roll through the city each week on just the BNSF Railway’s tracks alone. Those trains pass right by apartment buildings, homes, businesses and even schools. “Well just imagine the carnage,” said Christina Martinez. She was standing alongside the BNSF tracks in Chicago’s Pilsen neighborhood as a long train of black tank cars slowly rolled by, right across the street from St. Procopius, the Catholic elementary school her six-year-old attends. New federal rules require stronger tank cars, with thicker shells and higher front and back safety shields for shipping crude oil and other flammable liquids. Older, weaker models that more easily rupture will have to be retrofitted or replaced within three to five years. But Martinez and others wanted rules limiting the volatility of what’s going into those tank cars, too. Oil from North Dakota has a highly combustible mix of natural gases including butane, methane and propane. The state requires the conditioning of the gas and oil at the wellhead so the vapor pressure is below 13.7 pounds per square inch before it’s shipped. But even at that level, oil from derailed tank cars has exploded into flames. And many safety advocates had hoped federal regulators would require conditioning to lower the vapor pressure even more. Others criticize the rules for giving shippers three to five years to either strengthen or replace the weakest tank cars. A coalition of environmental groups — including Earthjustice, ForestEthics and the Sierra Club — sued, alleging that loopholes could allow some dangerous tank cars to remain on the tracks for up to a decade. “I don’t think our federal regulators did the job that they needed to do here; I think they wimped out, as it were,” said Tom Weisner, mayor of Aurora, Ill., a city of 200,000 about 40 miles west of Chicago that has seen a dramatic increase in oil trains rumbling through it. Weisner is upset the new rules provide exemptions to trains with fewer than 20 contiguous tank cars of a flammable liquid, such as oil, and for trains with fewer than 35 such tank cars in total. “They’ve left a hole in the regulations that you could drive a freight train through,” Weisner said. At the same time, an oil industry group is challenging the new regulations in court, too, arguing that manufacturers won’t be able to build and retrofit tank cars fast enough to meet the requirements. The railroad industry is also taking action against the new crude-by-rail rules, filing an appeal of the new rules with the Department of Transportation. AAR’s President Ed Hamberger discussed the problems the railroads have with the new rules in an interview with NPR prior to filing the appeal. “The one that we have real problems with is requiring something called ECP brakes — electronically controlled pneumatic brakes,” he said, adding the new braking system that the federal government is mandating is unproven. Acting Federal Railroad Administrator Sarah Feinberg disagreed. “It’s not unproven at all,” she said, noting that the railroads say ECP brakes could cost nearly $10,000 per tank car. Feinberg said her agency is still studying whether to regulate the volatility of crude, but some in Congress don’t think this safety matter can wait. Cantwell is sponsoring legislation to force oil producers to reduce the crude’s volatility to make it less explosive, before shipping it on the nation’s rails.